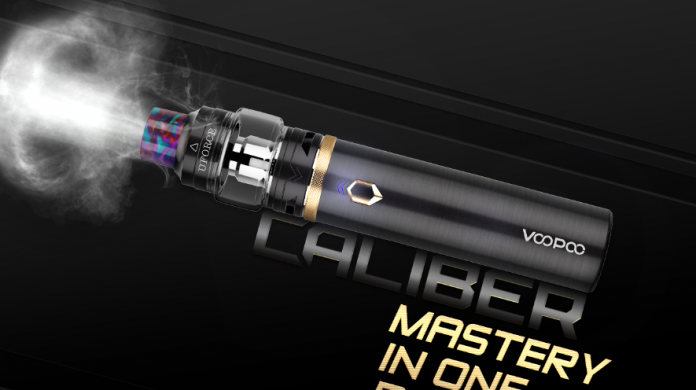 The Voopoo Caliber 110W starter kit is the newest device from popular vape manufacturer Voopoo and set to release in Late August of 2018. Plus an internal battery, non-adjustable stick mod with a DTL Uforce tank made for low mg nicotine juices. 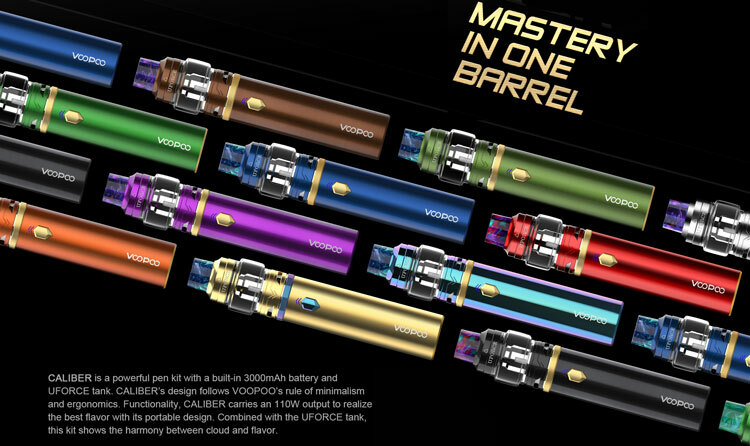 It’s the Voopoo version of a stick kit like the smok stick, the eleaf iJust3 or Vaporesso cascade one plus. The kit is available in 11 colors, Black, Silver, Bronze, Orange, Red, Gold, Rainbow, Blue, Army Green, Green, and Purple. Grab it quick because it is available for pre-order only in the $40-$55 price range. 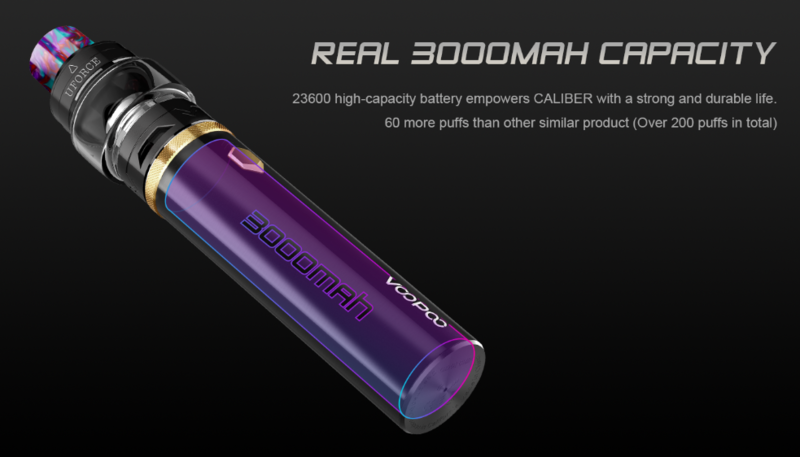 The Voopoo Caliber Starter Kit is a new starter stick-style device from Voopoo. The main draw of this kit is it’s small, lightweight, easy to use and easy to carry and is also a separate battery and tank and not an AIO. It’s similar to the vaporesso cascade one plus and eleaf ijust3. The mod itself is a solid metal body that feels really well built. The mod uses a 5 click to turn on and off. There is a front-facing LED above the fire button that lights up when firing or charging the device. When charging the light will be blue and when it’s complete the light will shut off. The device will also enter a standby mode after 30 minutes of not being used and you can wake it up by clicking fire twice. The Mod is a direct output device so output will go down as the battery drains. There is no battery meter which I feel is a poor decision. It features a built-in large 3000mah 23600 battery which is a nice size for this kind of device. The stick is just really nice overall and beautiful especially the coloring on the rainbow sample I have, but I would have liked to see a battery meter. The charge rate is listed as a 1A charge rate which is a little disappointing. I would have liked to see a 2A fast charging personally. It comes with the Uforce Tank which is a 24.6mm DTL sub ohm tank with no bulges. The tank comes with a standard 3ml capacity glass and a 5ml capacity bubble glass. The 5ml capacity is awesome in this. There is also an optional 5.5ml standard glass and a optional 8ml bubble glass for a huge capacity upgrade, as well as a 1.8ml glass for the TPD version. All the threading is really nice on the tank as well and it’s easy to take apart. The AFC is smooth and easy to adjust and on a stopper. They use 3 large bottom airflow holes equally spaced apart. They also include a matching resin 810 tip. The coils are installed like most tanks where they are screwed into the base. The fill method is your standard slide back which is clearly marked on the tank and easy to use. 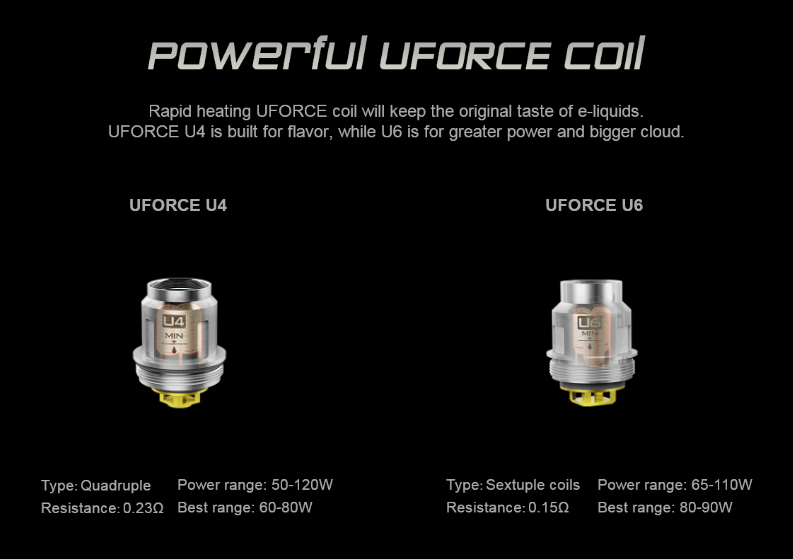 It comes with 2 coil options but you can use any of the u-force coils as well. One is a .23 ohm U4 coil (Best 60-80 watts) and the other a .15 U6 coil (Best 80-90 watts). Both coils are best used with 70% VG lower nicotine juices. The coils are going to be interesting though as I feel the battery may not power them correctly but I’ll figure that out before my review with my usage and testing. So there could be an issue there. So far I’m only using the 0.23-ohm coil and it feels underpowered. Most of these stick mods with a 0.23-ohm coil and full charge will output around 55-60 watts which is right below the “best range” for the U4 coil. For the 0.15 coil when I tested a few other sticks the eleaf ijust3 which was terrible couldn’t power anything at that resistance. The cascade one plus however performed great outputting 76 watts with a 0.15 coil but even if the Voopoo caliber was to match that it would still be below the “best range” of the 0.15 U4 coil. 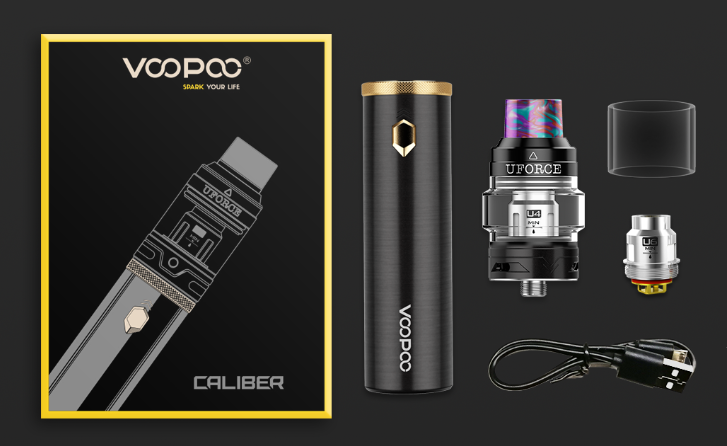 Overall the Voopoo Caliber 110W starter kit has all the makings to fill the need for this style device but it’ll depend on if the battery can power the coils correctly or not if they want to dethrone the cascade one plus as the best option for this style of kit.